Ah, bumps. The anguish and the glory. A good race, at least for the first half. We got a whistle on City 2 surprisingly early - not much past the bridge, perhaps earlier than yesterday. And two at First Post I think. We had good corners for FP and Grassy, and were at three whistles at the Plough. But the chop was really rather choppy, and spaced amongst the good rowing were a few thrown-off strokes that slowed us down. Going into Ditton we were a few inches off, I'm told, but our corner there wasn't so good and we kinda lost it down the Reach. Coming into the Railway bridge they'd pulled away, and behind us was the spectacle of Tabs 3 rowing their guts out to escape Nines 2 who had overlap; but didn't quite close them down either. M2: row over. Again! These boys like their row-overs. A confident M3 set out from Queens’ boathouse on night 3. Running slightly late as Rob had to make his sandwiches for the sandwich boat. Some very good paddling to the start boded well for the race. The Mills & Reeve crew behind had no chance to catch us on the start as we rated up to 40 plus and gained rapidly on the Cantabs 11 crew. The bump came at almost exactly the same spot as the previous evening’s - first post corner. Now, as Dr Doubleday’s snack had foretold, we were Sandwich boat. This meant a nice row down, willow-bedecked, to the finish marshalling point for a rest and then a row back up for the third division. A very nice practice start gave us that invincible feeling and we were ready to go for a ride on the hype-train for a 2nd time in one day. Waiting at Bait’s Bite Lock was a nice change - knowing we had straight-ish stretch to get up to speed. The canon started us of and, well, we went like a rocket. Rating at plus 40 before we knew it and almost immediately we were at one whistle. 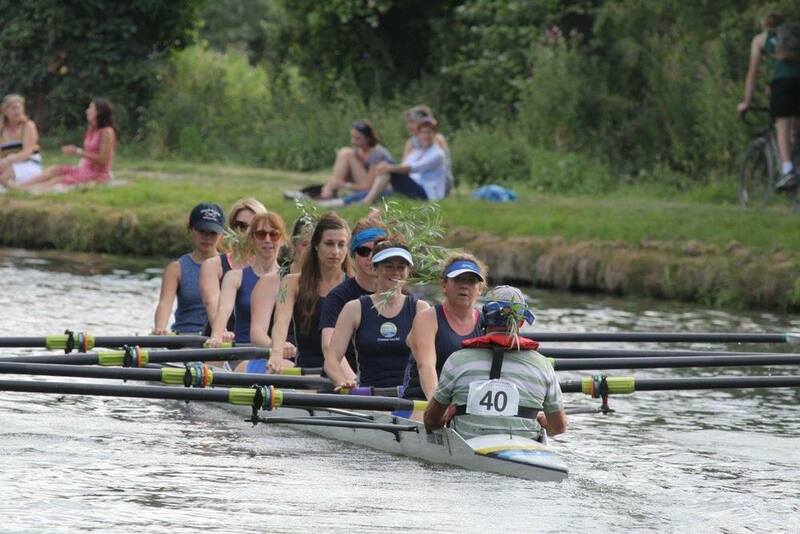 The crew ahead - an ARM boat, XPress 6 — were rowing nicely but we bumped them within 28 strokes, giving them no time to get into their rhythm Two bumps, one night… sounds like a Youtube sensation. 99s ahead of ARM bumped up again so we can be confident of a good final night. The old enemy St Neot's. Over the last three years they've stayed stubbornly out of reach. Tonight was to be no different. Without a cox box seemed only to make them go faster off the start. They went off like a rocket and Bumped Robs before First Post corner. City 3 behind were bumped surprisingly quickly behind by COWS. Champs appeared around Grassy but were bumped out too. We were left the only crew rowing with everything in front and behind bumped out. We wound down on the Reach but had a bit of a scare as Nines appeared 12 lengths behind and started to gain. But we took the rate up and were soon safely out of Reach at the Railway Bridge. row. Chasing Robs 4 in Division 2 from the lock. They are getting so close, with a 1/4 of a length. Let's close it down tonight. Once more at the outflow chasing Cantabs 7 but with Sarah C-Hs fresh legs. After some discussion between bank party and cox it was decided to push off as late as possible so as not to be pushed out by the outflow. It was tight but gave the crew little time to get tense. They had a good start and were soon within a length and gaining fast. The gap continued to close and the boats were soon overlapping with our bow ball way past the cox, they eventually conceded and "Hold it up" it was all over. The bow-ball had taken a bit of a hammering but nothing that some tape couldn't fix. A well deserved first Bump for W3 of the week.